Furman Now Shipping SS-6 Power Conditioner and 25’ Power Cord | Furman Power | Purifying power for over 40 years. The Furman SS-6 is a black steel chassis floor strip power conditioner that serves as a narrow form factor version of the top-selling SS-6B, with standard surge protection RFI/EMI filtering. Including six outlets, the SS-6 comes with a 15-foot captive cord and features a line voltage of 120V, a current rating of 15 amps, and a safety listing of cULus. 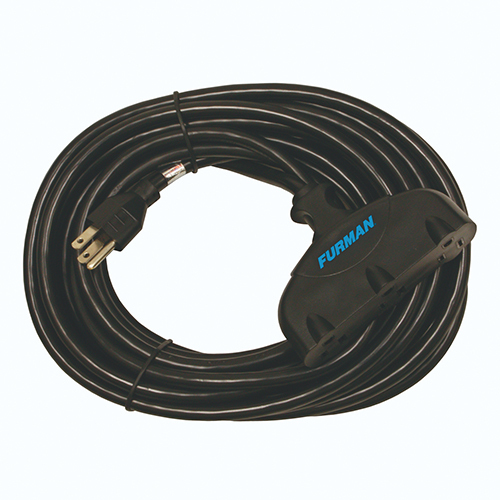 Designed to extend the protection from a power conditioner like the SS-6, the Furman ACX-25 is a discreet, 25-foot power cord that provides ultimate durability and longevity with a line voltage of 120V, a current rating of 15 amps, and a safety listing of cULus.